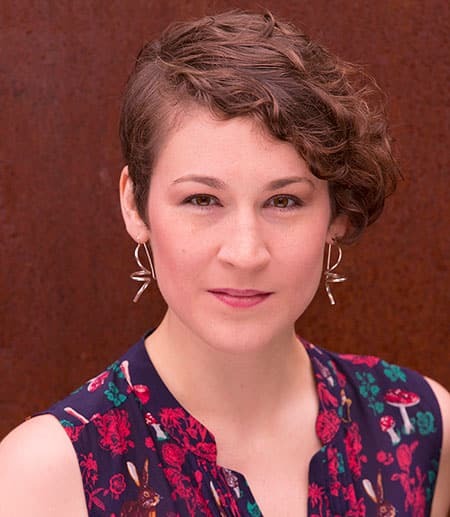 In a theatrical season marked by debate over the representation of women onstage and off, and by controversy surrounding male critics’ assessments of women’s stage artistry, Sara Holdren has emerged as a powerful and uncompromising new critical voice in the theatre. Her debut review essay, “The Revolution Will Not Be Hashtagged: A Misguided 'Joan of Arc' at the Public Theatre,” published in the online journal Culturebot in April 2017, provided an impassioned and razor-sharp critique so articulate and compelling that New York magazine soon thereafter appointed her its new theatre critic. The essay has inspired the selection committee of the George Jean Nathan Award for Dramatic Criticism to select Holdren as the 2016-2017 winner. Holdren is a Brooklyn-based director and teacher, as well as the theater critic for New York Magazine and Vulture.com. She is the Artistic Director of Tiltyard, a company dedicated to ensemble-driven riffs on classic texts. Recent directing projects include "MIDSUMMER" (Tiltyard), "Deer and the Lovers" by Emily Zemba, "The Zero Scenario" by Ryan Campbell, and "The Master and Margarita" by Mikhail Bulgakov. In 2015 she served as Artistic Director of the Yale Summer Cabaret, where she directed the original production of "MIDSUMMER" (which she co-adapted from the works of Shakespeare) and Sarah Ruhl’s adaptation of Virginia Woolf's "Orlando." Other work includes: "Measure for Measure," "The Tempest," and her own adaptations of Shakespeare’s Henry IV plays and Leonid Andreyev’s "He Who Gets Slapped." Holdren has taught classes in the Stanislavsky-based acting technique Analysis Through Action at Primary Stages and the New School. She is a 2016 Drama League Fellow and a graduate of Yale University (BA, Theater Studies) and Yale School of Drama (MFA, Directing). The Nathan Award was endowed by George Jean Nathan (1882-1958), a prominent theater critic who published 34 books on the theater and co-edited (with H.L. Mencken) two influential magazines, “The Smart Set and The American Mercury.” Nathan graduated from Cornell in 1904; as a student, he served as editor of The Cornell Daily Sun and the humor magazine The Cornell Widow. Previous winners include Jill Dolan, Randy Gener, Alisa Solomon, Charles Isherwood, Elinor Fuchs, Hilton Als, Cornell professor H. Scott McMillin, and last year’s winner, Shonni Enelow. More information about the Nathan Award can be found here.